Jonny Gambell gets to test the new Severne Nano 83! Today I got the chance to finally use the Severne Nano 83. I was a bit sceptical to begin with as I’m quite heavy (90KG) and thought it would be a bit small for me. 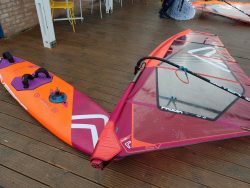 However, once the wind picked up and I was fully powered up on my 4.4 Freek, the board accelerated quickly and was extremely fast to get on the plane due to its efficient rocker. Once planing, the Nano performed fantastically in the range of tricky conditions Wells had to offer. The volume distribution of the board was exactly where required and made the board feel more like a 90L board than 80L! One specific feature of the design which really made the board is its progressive rails. Blending from a thin rail at the tail to a fuller rail towards the nose, the board is really pinned down below your feet and bites agressively into turns, while at the same time, the front rides high above the chop and broken waves.